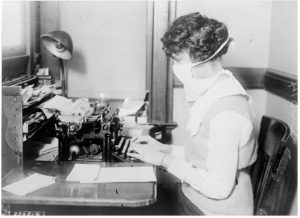 By October 8, 1918, 70 cases of influenza had been recorded at the University of Missouri. Classes were canceled beginning on October 7th and movement barred around the campus. On the front page of the Evening Missourian influenza was mentioned fifteen times, while simultaneously noting that the 4th Liberty Loan, bonds that were sold to fund American forces in WWI, had been a continued success, raising $83 million nationwide overnight, bringing the total to more than $1.4 billion. In less than a week a daily count of influenza cases would mar the front page of the evening newspaper. The evening papers of October 19, 1918, reported that Missouri had more than 10,000 cases of influenza. Springfield, Kansas City and St. Louis represented the greatest number, with Springfield being the hardest hit with more than 3,000. In Columbia, three University buildings (Read Hall, Pi Kappa Alpha house & Kappa Sigma house) were used as hospitals to supplement the two others in the city – Parker Memorial and the city hospital. In addition, the city placed many private homes under quarantine when it became known that the inhabitants were stricken with flu. A Home Service Bureau was established to care for the home-bound patients. The number of patients ebbed and flowed through November and December. On November 29, ninety-seven new cases were reported. 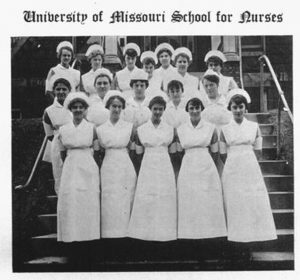 By December 6, 1918, the University of Missouri closed to prevent further outbreak, as the city closed schools, courts, and public administration services while reinstating a ban on meetings and limiting the number of patrons in a store to no more than six at one time. Women studying at Missouri University stepped up to the challenge. When three make-shift hospitals were opened on campus, ninety-eight female students answered the call for volunteer nurses, working eight to twelve hour shifts daily. Headquarters were set up by Mrs. Noyes in Captain Guy Noyes’ office in the Exchange National Bank Building downtown. Many of the University women had no prior training, but learned on the job. Their success rate was so high they were sent to assist at the other Columbia hospitals. By mid-December 1,020 cases of influenza cared for by all Missouri University hospitals. So what about the masks? By the end of October the university women of the Red Cross had made hundreds of masks by cutting a piece of white muslin, in 8” x 10” sections, and affixing it to the face with white tape that had been sown to the mask to enable the wearer to tie it around the back of his or her head, completely covering the nose and mouth. The masks were sold for ten cents at Academic Hall (Jesse). Influenza cases waned again in early 1919, only to rise again in January 1920. The Missouri women who accepted the call were unsung heroes during these trying times. The Evening Missourian. 8 Oct 1918. 1. The Evening Missourian. 19 Oct 1918. 3. “M.U. Girls Show Mettle in Influenza Epidemic.” The Evening Missourian. 23 Oct 1918. 3. Historic Preservation Note: According to a 2008 Columbia Tribune article Exchange National Bank was founded in Columbia on July 19, 1865, with $100,000 in capital. 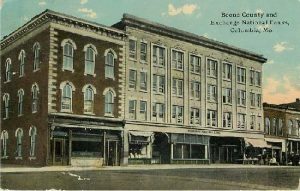 It was located at the northeast corner of Broadway & Eighth Street. It was purchased in 1964 by Carl Landrum, and seven years later the name was changed to First National Bank & Trust Co. Of the nine banks chartered in Missouri in 1865, Exchange National was the only one that survived. Today the name has changed to Landmark Bank with banks across Missouri, Oklahoma and Texas. Source: Justin Willett. “Exchange National Bank was started in Columbia 143 years ago.” Columbia Tribune. 22 Nov 2009 and “Our History” at Landmarkbank.com.